Baseline cardiovascular radio-telemetry parameters from littermate and K14cre- mice. Baseline parameters were recorded continuously over 28 hr in a 12hr-light/12hr-dark (shaded area) cycle. Data lines for littermate (black, n = 10), K14cre-HIF-1α (blue, n = 9), K14cre-HIF-2α (red, n = 7), K14cre-Arg1 (red, n = 5), K14cre-NOS2 (orange, n = 6) (A) show heart rate as mean beads per minute (B) mean blood pressure shown as mm/Hg, (C) temperature shown as mean degree’s Celsius and (D) physical activity shown as mean meters per hour. Statistical analysis: Area under curved was determined for each mouse per group and each group was further analysed by mann-Whitney test. Mean blood pressure K14cre-HIF-2α (p=0.0274) and K14cre-NOS2 (p=0.0120) and skin temperature K14cre-Arg1 (p=0.0350) compared to littermate control. Cardiovascular response to graded hypoxia in wild-type (C57/Bl6) animals. 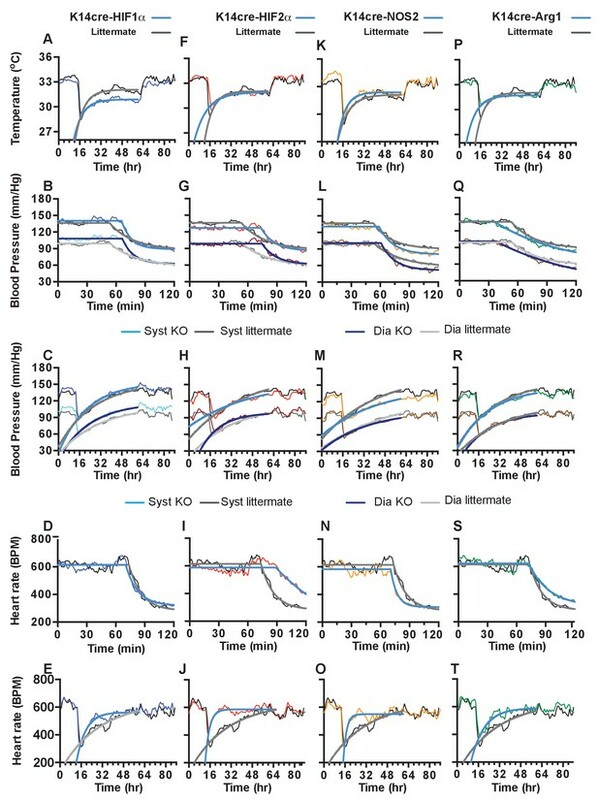 Mice were individually housed for 14 hr in normoxia before being exposed to hypoxia (15% O2 (dark red, n = 4), 12% O2 (green, n = 5), 10% O2 (blue, n = 8)) at the light-dark interphase for 48 hr. Mice then recovered for a further 24 hr in normoxia. (A) Acute analysis of systolic and (B) diastolic blood pressure shown as mean (mm/Hg). Data shows 60 min of normoxia followed by 60 min of hypoxia. The dotted line depicts point of transition from normoxia to hypoxia. (C) Chronic systolic and (D) diastolic acclimation to hypoxia. Data shown as mean (mm/Hg) (shaded area depicts dark cycle) (E) Acute and (F) chronic heart rate acclimation to hypoxia. Data shown as mean beats per minutes. (G) Chronic Skin temperature acclimation to hypoxia. Data shown as mean degrees Celsius. 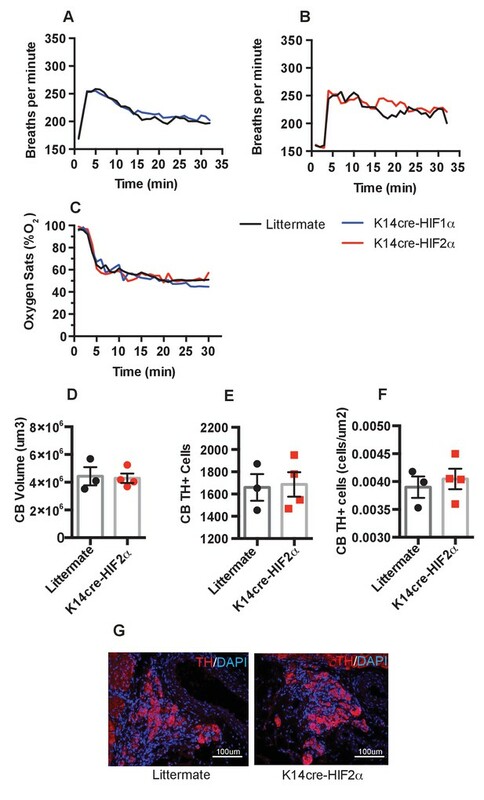 Keratinocyte deletion of HIF-1α affects cardiovascular acclimation to hypoxia. Mice were individually housed for 14 hr in normoxia before being exposed to hypoxia (10%) at the light-dark interphase for 48 hr. Mice then recovered for a further 24 hr in normoxia. (A) Chronic skin temperature acclimation in littermate (black line, n = 7) and K14cre-HIF-1α (blue line n = 8). Data shown as mean degree’s Celsius (shaded areas depict dark cycle). Lower line graph shows temperature deviation of K14cre-HIF-1α from littermate during the procedure. (B) Skin temperature was monitor by an infrared thermal imaging camera before and during hypoxia (10% O2) exposure. 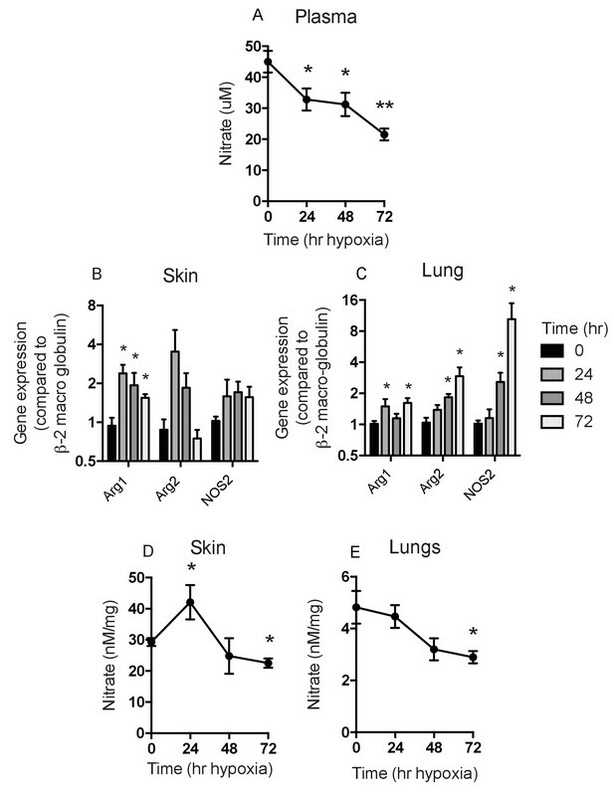 Analysis of thermal infrared images suggests that K14cre-HIF-1α (n = 5) does not substantially impact skin temperature when compared to littermate (n = 5) controls during the first 5 hr of hypoxia. (C) Acute and (D) chronic analysis of systolic and diastolic blood pressure in littermate (black-line and grey-line n = 8) and K14cre-HIF-1α (dark blue line and light blue line n = 7) respectively. Data shown as mean (mm/Hg). Lower line graph shows blood pressure deviation for both chronic systolic (dark blue) and diastolic (light blue) BP. (E) Acute and (F) chronic analysis of heart rate in littermate (black line n = 6) and K14cre-HIF-1α (dark blue line n = 8). Data shown as mean beats per minute. Lower line graph shows chronic heart rate deviation of K14cre-HIF-1α from littermate. (G) Analysis of metabolic activity during the chronic acclimation of littermate (black line, n = 7) and K14cre-HIF-1α (dark blue line n = 5) to hypoxia. Data shown as mean oxygen consumption VO2 and (H) carbon dioxide generated VCO2 ml/Kg/hr. (I) Analysis of physical activity in littermate (black line n = 6) and K14cre-HIF-1α (dark blue line n = 7) during acclimation to chronic hypoxia. Data shown as mean activity meters/hour. 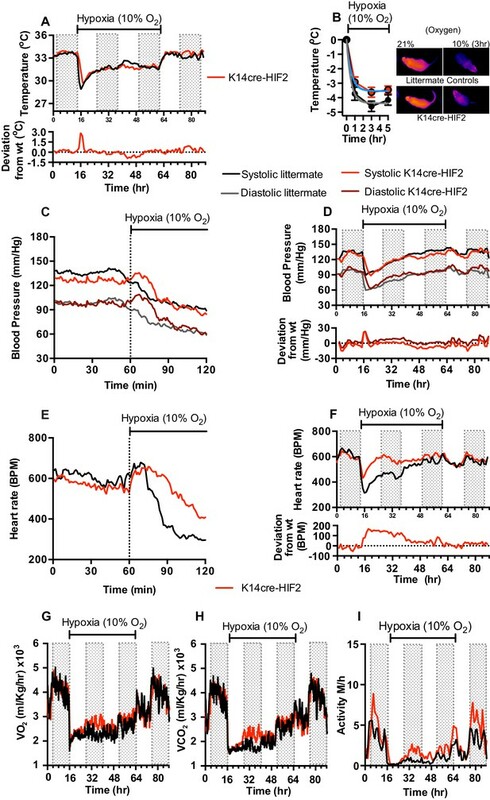 Keratinocyte deletion of HIF-2α affects cardiovascular acclimation to hypoxia. Mice were individually housed for 14 hr in normoxia before being exposed to hypoxia (10%) at the light-dark interphase for 48 hr. Mice then recovered for a further 24 hr in normoxia. (A) Skin temperature acclimation in littermate (black line, n = 7) and K14cre-HIF-2α (red line n = 7). Data shown as mean degree’s Celsius (shaded area depicts dark cycle). Lower line graph shows temperature deviation of K14cre-HIF-2α from littermate. (B) Skin temperature was monitor by an infrared thermal imaging camera before and during hypoxia (10% O2) exposure. 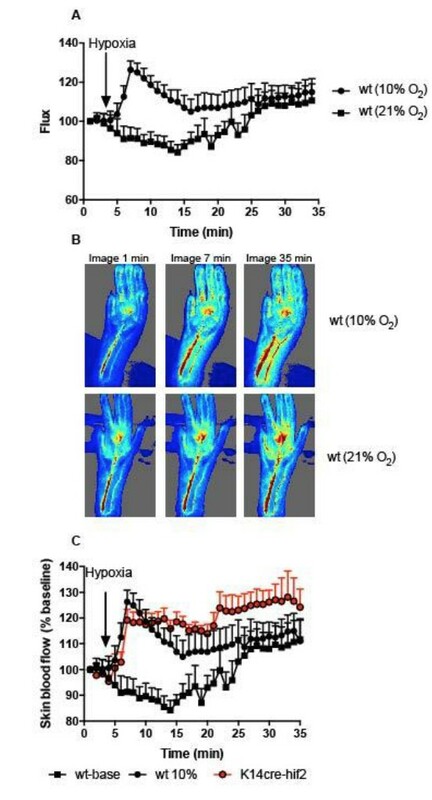 Thermal infrared imaging suggests that K14cre-HIF-2α (n = 9) impacts skin temperature when compared to littermate (n = 5) controls during the first 5 hr of hypoxia. Photomicrographs show representative thermal images during hypoxic exposure. (C) Acute and (D) chronic analysis of systolic and diastolic blood pressure in littermate (black-line and grey-line n = 8) and K14cre-HIF-2α (dark red line and light red line n = 7) data shown as mean (mm/Hg). Lower line graph shows blood pressure deviation for both systolic (light red) and diastolic (dark red) BP. (E) Acute and (F) chronic analysis of heart rate in littermate (black line n = 6) and K14cre-HIF-2α (red line n = 6). Data shown as mean beats per minute. Lower line graph shows chronic heart rate deviation of K14cre-HIF-2α from littermate. 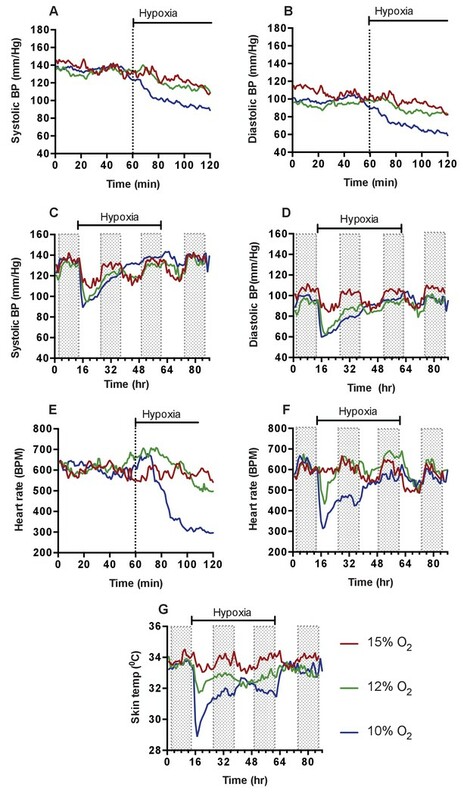 (G) Analysis of metabolic activity during the chronic acclimation of littermate (black line, n = 6) and K14cre-HIF-2α (red line n = 7) to hypoxia. Data shown as mean oxygen consumption VO2 and (H) carbon dioxide generated VCO2 ml/Kg/hr. (I) Analysis of physical activity in littermate (black line n = 6) and K14cre-HIF-2α (red line n = 7) during acclimation to chronic hypoxia. Data shown as mean activity meters/hour. Analysis of Nitrates and NOS2–arginase gene expression. Tissues and fluids were harvested from hypoxic mice (C57/Bl6 wild-type) at the time points shown and analysed for nitrate content and the gene expression of NOS2 and arginase-1/-2. (A) plasma nitrate concentration shown as mean ±SEM μM (n = 8). (B) Skin and (C) lung qPCR analysis of NOS2 and arginase expression. Data shown as mean ±SEM of fold change in gene expression compared to normoxia control (β−2 macroglobulin house-keeping gene using 2-ΔΔCT method)(n = 8). (D) Skin and (E) lung nitrate concentration shown as mean ±SEM μM (n = 8). Statistical analysis using mann-Whitney test (*p≤0.05 **p≤0.005). 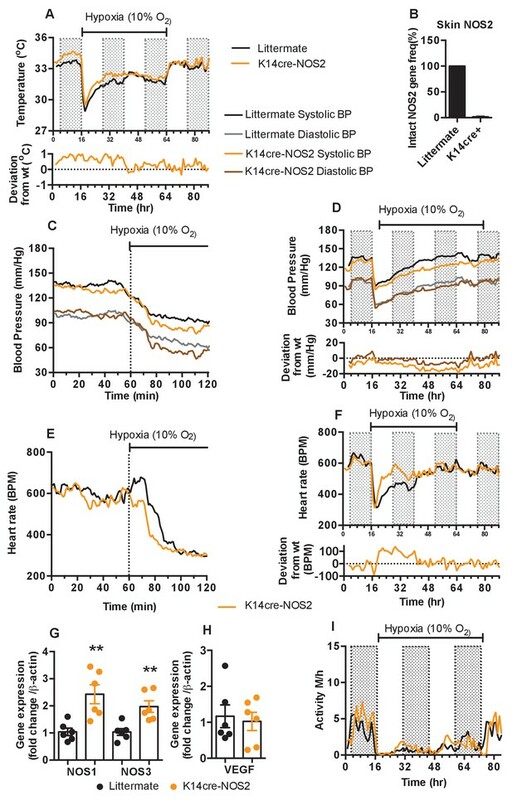 Keratinocyte deletion of NOS2 affects cardiovascular acclimation to hypoxia. Mice were individually housed for 14 hr in normoxia before being exposed to hypoxia (10%) at the light-dark interphase for 48 hr. Mice then recovered for a further 24 hr in normoxia. (A) Skin temperature acclimation in littermate (black line, n = 7) and K14cre-NOS2 (red line n = 5). Data shown as mean degree’s Celsius (shaded area depicts dark cycle). (B) Deletion efficiency of NOS2 in K14cre+ mice was calculated by Taq-man PCR. (C) Acute and (D) chronic analysis of systolic and diastolic blood pressure in littermate (black-line and grey-line n = 8) and K14cre-NOS2 (dark red line and light red line n = 5) data shown as mean (mm/Hg). Lower line graph shows blood pressure deviation for both systolic (light red) and diastolic (dark red) BP. (E) Acute and (F) chronic analysis of heart rate in littermate (black line n = 6) and K14cre-NOS2 (red line n = 5). Data shown as mean beats per minute. Lower line graph shows chronic heart rate deviation of K14cre-NOS2 from littermate. (G and H) RT-qPCR analysis of whole skin samples from K14cre-NOS2 (n = 6) and littermate mice (n = 6) following 6 hr hypoxia (10% O2) exposure. (G) Epidermal NOS2 deletion stimulates enhanced expression of NOS1 and NOS3. (H) Skin VEGF expression is not effect by NOS2. (I) Analysis of physical activity in littermate (black line n = 6) and K14cre-NOS2 (red line n = 7) during acclimation to chronic hypoxia. Data shown as mean activity meters/hour. 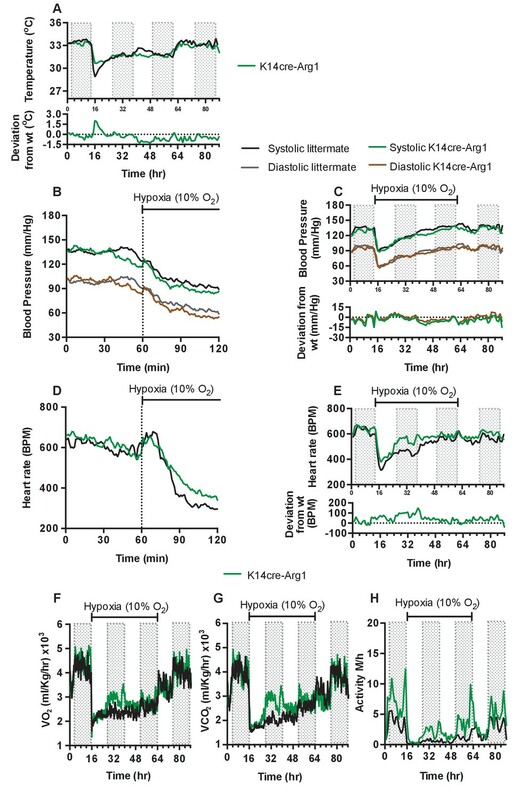 Keratinocyte deletion of arginase-1 affects cardiovascular acclimation to hypoxia. Mice were individually housed for 14 hr in normoxia before being exposed to hypoxia (10%) at the light-dark interphase for 48 hr. Mice then recovered for a further 24 hr in normoxia. (A) Skin temperature acclimation in littermate (black line, n = 7) and K14cre-arginase-1 (green line n = 6). Data shown as mean degree’s Celsius. Lower line graph shows temperature deviation of K14cre-arg-1 from littermate. (B) Acute and (C) chronic analysis of systolic and diastolic blood pressure in littermate (black-line and grey-line n = 6) and K14cre-arg-1 (dark green line and brown line n = 6) respectively. Data shown as mean (mm/Hg). Lower line graph shows blood pressure deviation for K14cre-arg1 compared to littermate for both chronic systolic (green line) and diastolic (brown line) BP. (D) Acute and (E) chronic analysis of heart rate in littermate (black line n = 6) and K14cre-arg-1 (green line n = 6). Data shown as mean beats per minute. Lower line graph shows chronic heart rate deviation of K14cre-arg1 from littermate. (F) Analysis of metabolic activity during the chronic acclimation of littermate (black line, n = 6) and K14cre-arg-1 (green line n = 6) to hypoxia. Data shown as mean oxygen consumption VO2 and (G) carbon dioxide generated VCO2 ml/Kg/hr. (H) Analysis of physical activity in littermate (black line n = 6) and K14cre-arg-1 (green line n = 6) during acclimation to chronic hypoxia. Data shown as mean activity meters/hour. Pulmonary respiratory response to acute hypoxia. (A and B) Ventilation rate in response to acute hypoxia was determined by whole-body plethysmography. Resting/normoxia ventilation was determined 60 min before acute hypoxic stimulus. Data shown as mean breaths/minute (HIF-1α n = 6, HIF-2α n = 4) (C) Percentage arterial oxygen saturation was recorded during the acute hypoxic challenge. Data recorded at 5 s interval mean (HIF-1α n = 6, HIF-2α n = 4). Keratinocyte HIF-2α deletion does not influence carotid body development. Quantification of (D) carotid body volume, (E) CB TH+ cells (F) CB TH+ cells per area tissue, (G) representative photomicrographs of TH+ cells in the carotid bifurcation in littermates and K14cre-HIF-2α mice. Statistical analysis of K14cre-HIF-1α, HIF-2α, NOS2 and Arg-1 compared to littermate control for skin temperature. 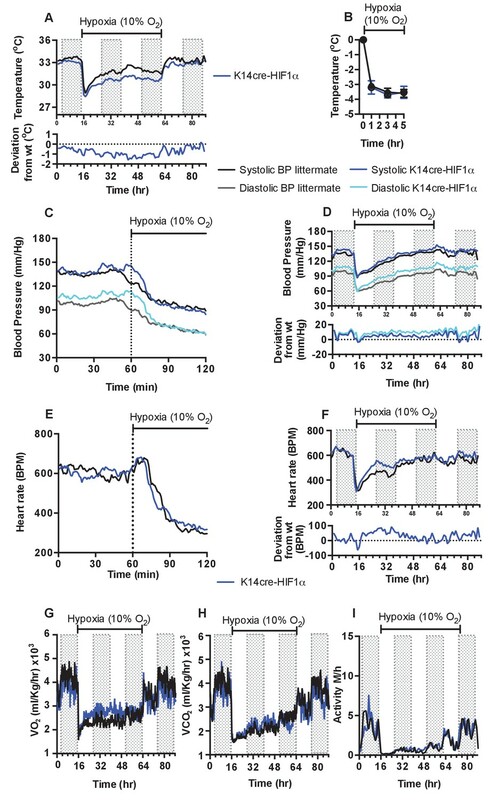 (A, F, K, P), systolic and diastolic blood pressure following acute hypoxia (B, G, L, Q), systolic and diastolic blood pressure following chronic hypoxia (C, H, M, R), heart rate following acute hypoxia (D, I, N, S) and heart rate following chronic hypoxia (E, J, O, T). Non-linear regression modelling was undertaken, using a least squares method, with Akaike’s Informative Criteria (AICc) used to determine whether the data could best be represented by a single model, or separate ones. The probablility of the data being best represented by two different models was >99.99% in all cases. Spreadsheet of means and standard deviations for all points described in the graphs of Figures 1–9.